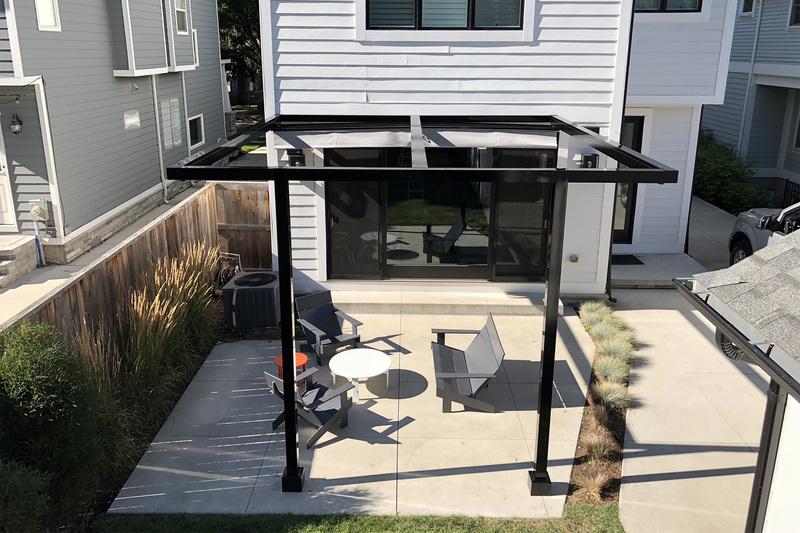 ShadeFX seized the opportunity to provide an attached structure with a retractable shade to match a clean and modern design. Our custom aluminum structure has a minimalist and seamless appearance which integrated perfectly with the black details outlining this two-story home. 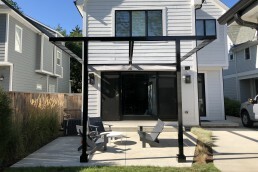 The Birmingham homeowners created a distinctive concrete patio in their backyard for various reasons. Not only does it define the area between the driveway and the yard, but it allows the rainwater to flow into the garden. Requiring maximum coverage for this uniquely shaped area, the homeowners stumbled upon ShadeFX. 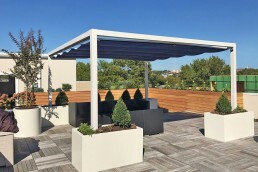 After discussing their concepts with a Product Specialist, and with a few tweaks from the Engineering team, it was determined the optimal solution would be to inset the structural posts. The homeowners opted to have the experts handle the installation. 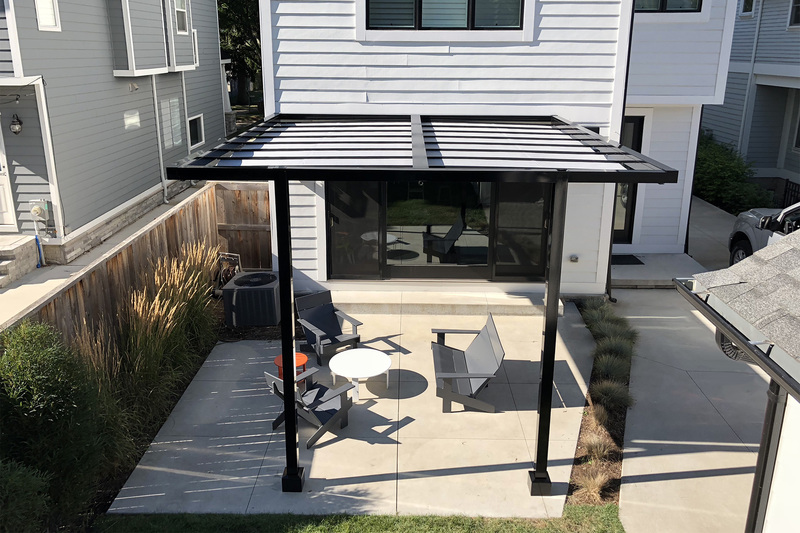 ShadeFX’s Service team travelled to the “booming city” of Birmingham and attached a 16’x14’ black structure to the back of the house. 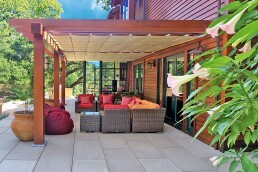 Aiming to match details and to provide enough door clearance, the homeowners benefited from the custom features offered. Three additional wings were incorporated reducing the canopy drop to 14.6” and Silica Gravel Sunbrella fabric was mounted to the top of the 10’ structure. The contemporary style of this solution uses all the elements typically found in an industrial area. However, these homeowners found a way to merge it with the architecture of their Birmingham residence. 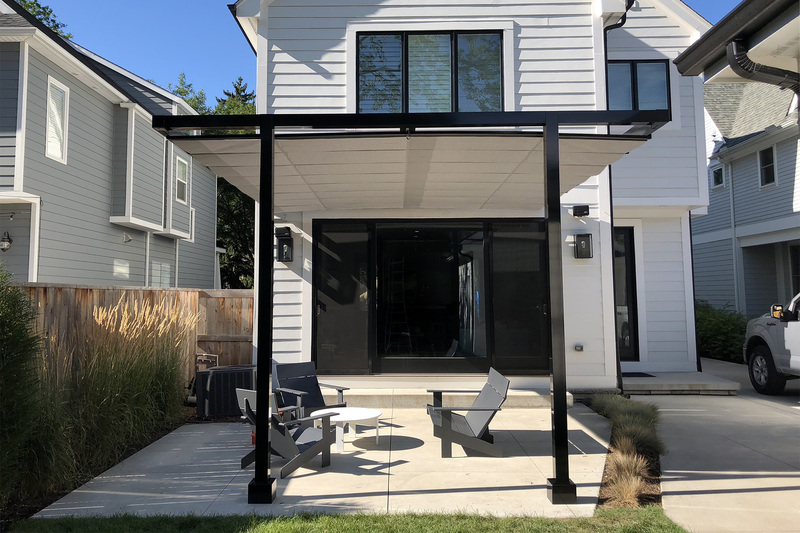 Designed with a neutral color palette of black, grey and white, this outdoor space has been transformed into a sensible living area. Every project is unique. 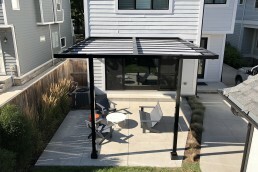 Let our experts help you find the best solution for your outdoor project. We’re here to help. 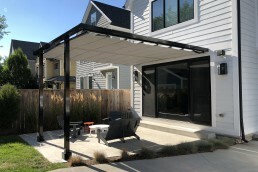 ShadeFX attached a 16’x14’ black structure to the back of the house. 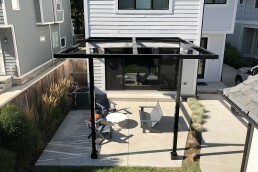 Inset posts were specified to accommodate the uniquely shaped patio. The end result, a cantilever structure with maximum coverage.